RIDERS IN THE UK have a lot to deal with. When not dodging grubby potholes and slippery drains, they’re hurriedly donning that emergency waterproof layer during a seasonal summer shower. J.Laverack know this cruel reality, and build bikes to suit it. “We make bikes to ride, whatever the weather, whatever the time of year,” explains co-founder Oliver Laverack. 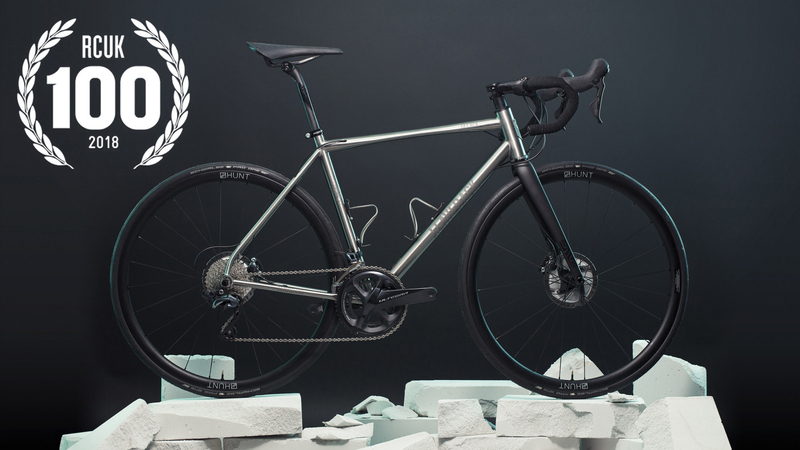 Named after Oliver’s grandfather Jack (a Yorkshireman through and through who wouldn’t think anything of going off on a 100-mile adventure with just a jam sandwich in his back pocket), the titanium specialists craft bikes that are as hard as the men and women that ride them, perfectly encapsulating that classic era of cycling. The J. Laverack R J.ACK Disc is, unsurprisingly, a disc-brake-bearing update to the company’s racing-focused R.JACK model. It’s also an unsurprising move for the company given road cycling’s recent embrace of the previously-shunned braking technology. As would be expected of a custom frame builder, every R J.ACK Disc is unique. Customer’s specifications ultimately dictate the titanium ride’s build, creating a bike that has soul as well as strength and speed by the bucket load. The tailored approach continues through to the frame’s geometry. Available in two styles, ‘classic’ or ‘race’, the choice has a knock-on effect on other aspects of the complete ride beyond angles and lengths of tubing. The classic is meant for long days in the saddle and comes with J.Laverack’s own carbon fork. The in-house fork has an exaggerated rake and helps contribute to the overall bike’s comfortable position. It is also available with mudguard lugs – highlighting how the classic R J.ACK Disc is meant to be used whatever the weather. 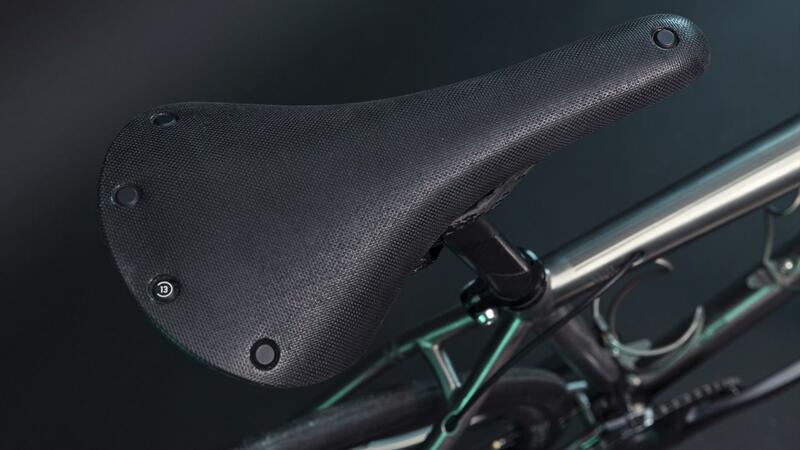 Meanwhile, the race version (pictured) is paired with carbon-specialist ENVE’s road disc fork: one of the top aftermarket carbon-fibre forks, built for going fast. 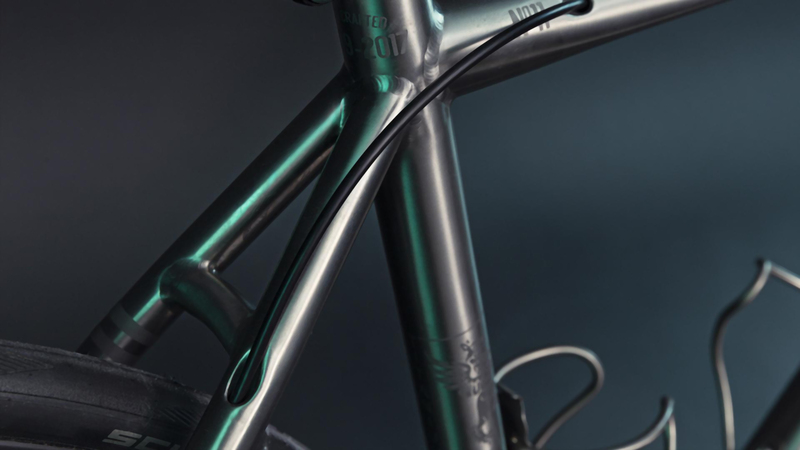 It really is a match made in heaven – the straight headtube, lower position and stubbier wheelbase all combining to create an incredibly responsive, aerodynamic ride. 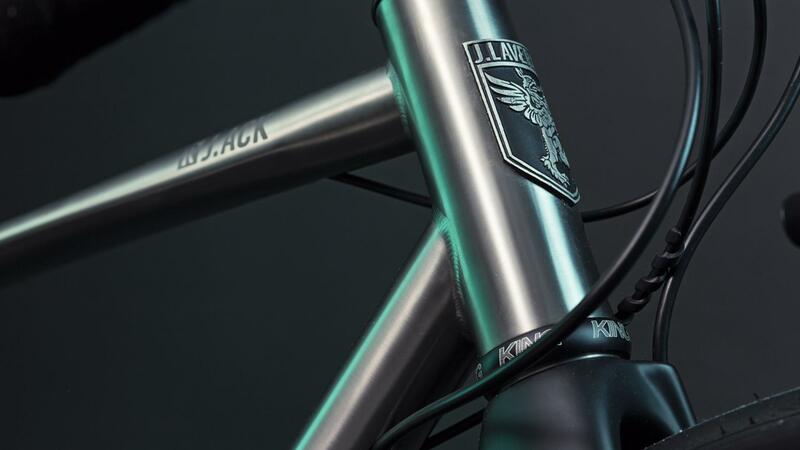 The customisation continues with the the bottom bracket, which can either be press fit or threaded depending on preference, and extends down to details such as the head badge design. Both geometries can fit up to 32mm tyres – mirroring the trend seen elsewhere for disc brakes and high volume tyres – that will help minimise rolling resistance and boost comfort. Both the race and classic versions have flat-mounted brakes, and come with the added security of 12mm thru axles front and back. The titanium frame is kept clean thanks to internal cable routing, which also keeps the mechanisms themselves running smoothly. 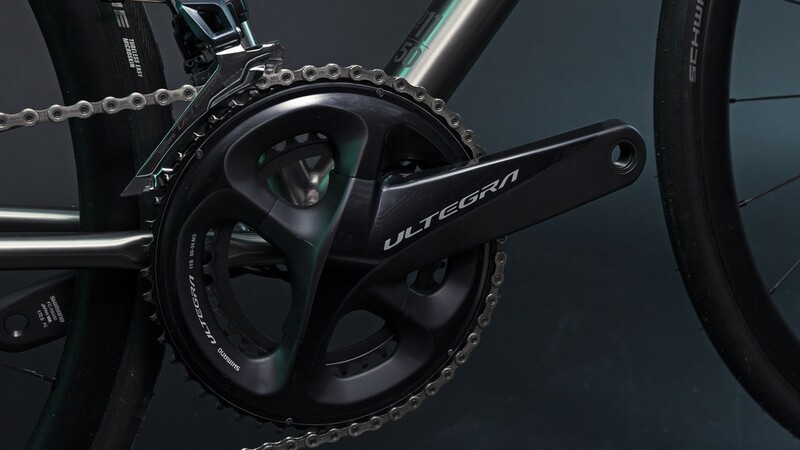 The R J.ACK Disc is available as a frame only, or as one of three build options – ranging from a 105 set-up with hydraulic disc brakes, through to an electronic shifting Dura Ace Di2 R9170. The model included in this year’s RCUK 100 is the mid-tier, Ultegra R8020 version, which comes fully loaded with Hunt 4Season 27mm wheels, a Brooks Cambium C15 saddle and Pro LT finishing kit. 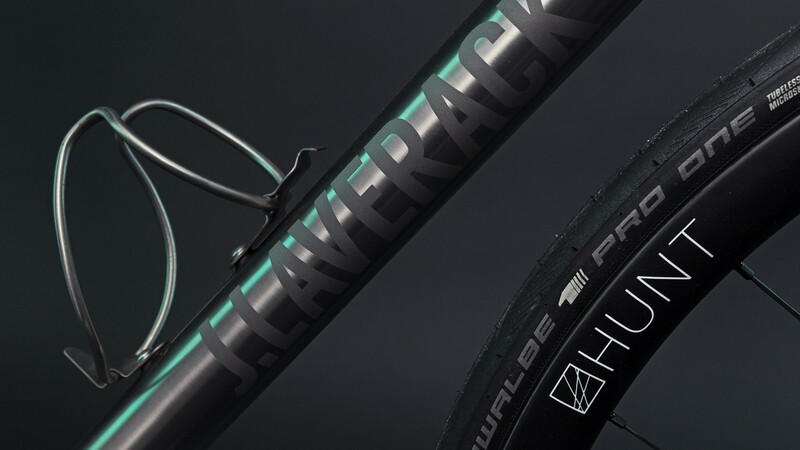 Whichever finishing package you choose, you can be sure the J. Laverack R J.ACK Disc will leave you with an exhilarating and fast ride that will be tough to beat.